Plants use two forms of nitrogen (N): nitrate N and ammonium N. The RAW Nitrogen from NPK Industries contains 20% Ammonium Nitrogen (N) in a water soluble form. 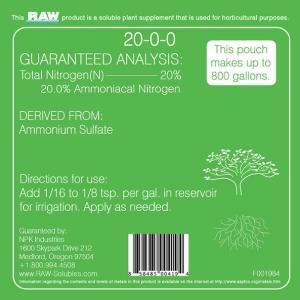 It is safe to use during all stages of growth and bloom as it does not contain nitrates or urea. Also can be safely used as a foliar feed and for boosting nitrogen (N) levels and treating deficiencies. *As always, moderation is always recommended when using additives. Start with very low dosages, see how the plants respond, and add more if necessary.